There are many sorting algorithms to sort the elements in the array. Some of the simple and widely used algorithms are as follows. In this C programming tutorial, we see the program for selection sort in C with explanation in detail. Selection sort is an algorithm where we keep finding the smallest element and then we order them in sequence. Keep a pointer to the first element of the array (says i). Select the smallest element from the array. Replace the smallest element with the array element placed at position ‘i’. Increment ‘i’ to point it to next element in the array. Repeat step 2, 3 and 4 until ‘i’ reaches to the last element in an array. 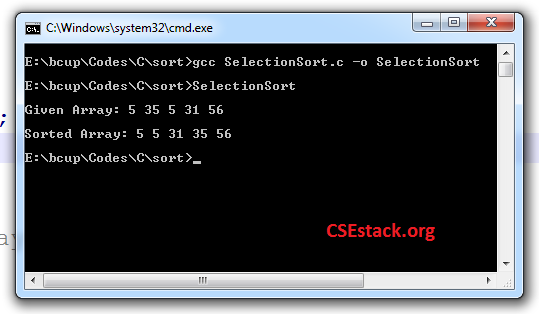 Selection sort is the in-place sorting algorithm, Why? Selection sort is the in-place sorting algorithm. It takes a constant amount of space and does not require any auxiliary data structure for sorting. However, it uses very small amount of memory to replace the elements. Note: We have assigned elements to the array in the program itself. You can take the array elements as user input as well. This program and algorithm sort the array in ascending order. If you want to sort the array in descending order, (step 2 in the algorithm) find the largest element rather than the smallest element. If you look at steps 2, 3, 4 and 5 iterates ‘n’ number of times. (Where n is a number of elements in the array (array size).) . So iterations take O(n) time. Within each iteration, you have to find out smallest element in the array. It takes the complexity of O(n). So the total complexity of the Selection sort algorithm is O(n)* O(n) i.e. O(n^2). Here, all three complexity will be the same. In the best case, we consider as the array is already sorted. But to find out the smallest element, we need to iterate and check for all the elements in the array. So the best complexity is the same a worst case complexity. You can also check if the array is already sorted before applying selection sort. In the best case, it saves your program execution time. Selection sort is easiest to implement and to code than other sorting algorithms. But, it is not much efficient in terms of time complexity. Easiest to implement and to code. Note: For most efficient algorithm as per time complexity, you can use heap or merge sort. They have O(n log(n)) time complexity. This is all about Selection Sort in C with Explanation. If you have any doubt feel free to write in a comment. Very well explained. It is good to improve my knowledge. Please add content about other sorting algorithms as well. Thanks and happy as you find it useful. I am working on writing about other sorting algorithms. It will get live soon. Stay tuned!